"Cynthia Higgins, Westbrook College, Class of 1978"
Westbrook College student Cynthia Higgins, Class of 1978, was a Medical Assistant major and a Day Hop. 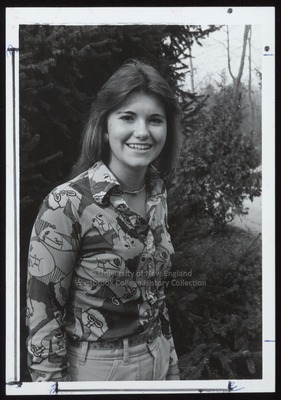 For her senior class candid photo, which appeared in the 1978 Tower Yearbook, she wore light-colored jeans and a long-sleeve blouse with whimsical, cartoon, expressive faces printed on the fabric. A canvas belt, gold choker necklace, and gold button earrings make up her accessories. Her long, dark hair was parted in the middle and hung down her back. Cynthia stands in front of an evergreen tree.